Bettering Environmental Stewardship & Technology Conference (BEST)will take place on Wednesday, May 9, 2018 to Friday, May 11, 2018, at the Fairmont Chateau Whistler​ in Whistler, BC. 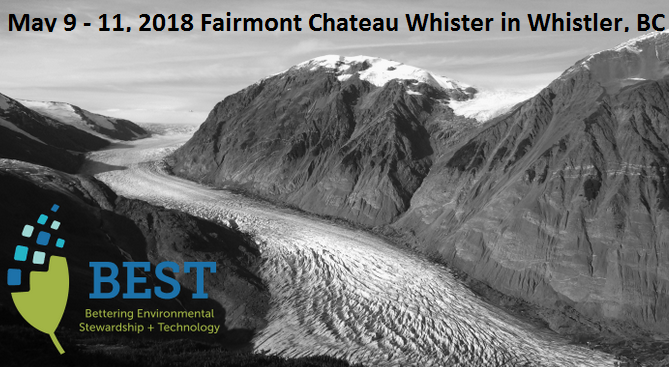 The British Columbia Environment Industry Association's BEST Conference attracts environmental professionals every May for two days of technical sessions, networking opportunities, and a sponsor exhibition. Conference registration includes a welcoming reception, technical sessions, keynote presentations, an off-site networking reception, and all meals and coffee breaks. Mike Harcourt is a passionate believer in the power of cities and communities to improve the human condition. He has steadfastly maintained his focus on conservation and sustainable development and because of his efforts has played a significant role in promoting quality of life for those in Canada and abroad. He has held significant urban posts his entire adult life and his interest in civil society, urban design, conservation and sustainable development have made him the leader he is today in advancing livability in our cities. Dr. Ken Coates is Canada Research Chair in Regional Innovation, Johnson-Shoyama Graduate School of Public Policy, University of Saskatchewan and Senior Fellow, Macdonald-Laurier Institute. His work focuses in Indigenous engagement in the resource economy, the social and economic impact of science and technology, and strategies for economic development in rural and remote regions. Anna Henolson, Trinity Consultants New Canadian Air Quality Standards and Implications for Industry in B.C.